Hunger in America, But Where Is the Media? What the Farm Bill Reveals about the State of American Journalism – molly niesen, ph.d.
After years of partisan wrangling, this week the House passed a version of the Farm Bill, which proposes $800 million dollars in cuts from the federal food stamp program, also known as the Supplemental Nutrition Assistance Program (SNAP). Although House Republicans initially sought a 5 percent cut, the compromise only proposes a 1 percent cut overall. What does this have to do with the current state media system? Everything. First, this story, told through the echo chamber of U.S. news, has lacked a critical perspective on how this 1 percent cut will actually affect those receiving SNAP benefits. While most stories have explained the ways in which this was a compromise between Democrats and Republicans, ostensibly to save money and close loopholes, very few news reports have gone beyond the political rhetoric to actually include a human element, neglecting to show the faces of what Congress has callously referred to as a “loophole”: SNAP beneficiaries. What’s more, although many new stories reference the record number of participants in the program, very few actually connect the obvious relationship between increased enrollment and increased inequality/poverty (with the exception of nods to how the recession in 2008 increased enrollment numbers). 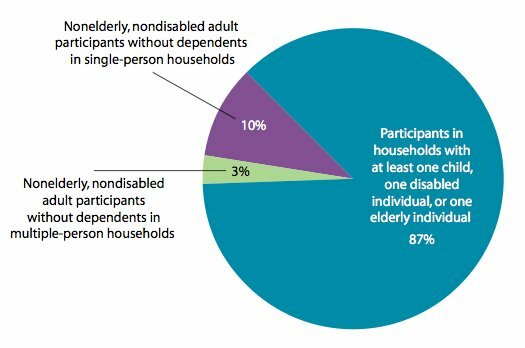 The unstated fact remains: 83 percent of all SNAP (food stamp) benefits go to households with at least one child, an elderly person or a disabled person. This isn’t just about poverty, but about the playing field, more broadly. Wages are growing at a slower rate relative to corporate profits more than any other in time U.S. history. By shifting funds from the most vulnerable among us for corporate subsidies, the farm bill epitomizes the way polices can further widen this gap. The Congressional Budget Office (CBO) estimates that four million people would be booted out of the program. This winter, among the coldest on record, has created a surge in federal heating assistance for qualifying households. This means that the marginal assistance money for heat (in some cases, as low as $20 a month) disqualifies families for food stamps, forcing families to choose between warm homes or food security. One of the major cuts to the bill prevents people from reducing federal heating assistance benefits so they would not be disqualified for food stamps, something many northern states had allowed, so recipients wouldn’t have had to make this hard choice. Eliminating this so-called loophole would reduce benefits to some 850,000 households. The second element missing from the story is the ways in which the bill expands corporate farm welfare by $7 billion, mostly increasing the amount of taxpayer money to subsidize crop insurance programs. While many of the new stories about the farm bill feature stock photos of the happy family farmer, clutching his crops in the fields, these images belie the fact that most of these subsidies are for large-scale agribusinesses that have a stake in the land, but never work the fields themselves. With little transparency in the insurance system, it’s difficult to ascertain who gets the subsidies and who doesn’t, translating to cases of crop insurance fraud. Last year alone, In North Carolina, 41 defendants were found guilty of defrauding taxpayers through the crop insurance program in the amount $100 million. That’s 1 eighth of the amount, by the way, of the cuts in SNAP benefits, posing the question of which “loopholes” might be worth closing. What’s more, the bill removes a requirement for lawmakers themselves to disclose the amount of crop insurance they receive. 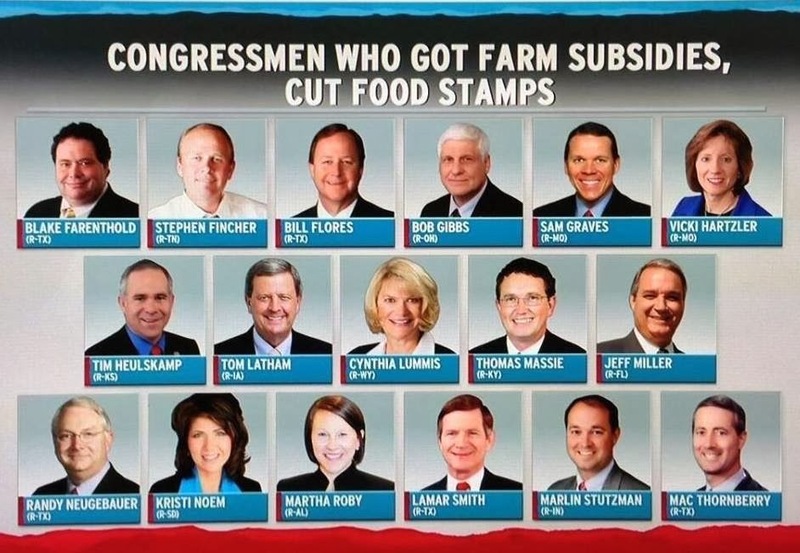 Ironically, these same members of congress advocated for even more cuts in SNAP because of the fraud in the system, arguing that recipients of food stamps should have to undergo mandatory drug testing. Food stamps vs. farm subsidies. The most important element missing from this, and other new stories about subsidies for lower-income Americans, is a critical historical perspective about food stamp programs and hunger in America, one that the national news media at one time provided. The 1960s and 1970s is widely regarded as a high water mark for professional journalism in the United States. It is not coincidental that this period was also defined by the largest increase in government assistance programs since the New Deal. 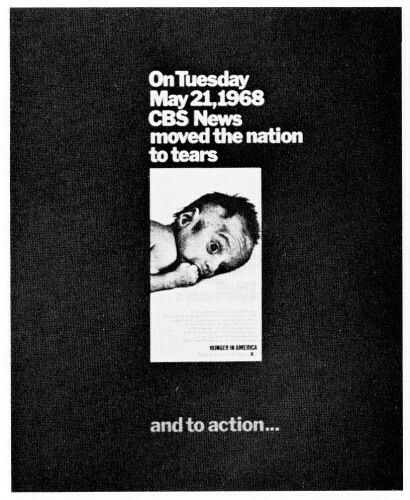 In 1968, CBS aired the documentary Hunger in America, bringing the realities of hunger and food insecurity to millions of viewers. This report was the catalyst for widespread public support for an expansion of hunger relief programs. This is how democracy and the media system ideally should work in tandem: a journalistic expose informs the public, and the public reacts by pressuring lawmakers to respond. And they certainly did after the documentary aired. The Food Stamp Program was greatly expanded in 1973, supported by both Democrats and Republicans, and this policy virtually eliminated hunger in America. In 1980, the cuts began, and have continued ever since, under both Republican and Democratic leadership. Because of these cuts, the number of hungry families has jumped 500 percent. Currently, 50 million Americans are considered food insecure, meaning they do not know where there meal is coming from. 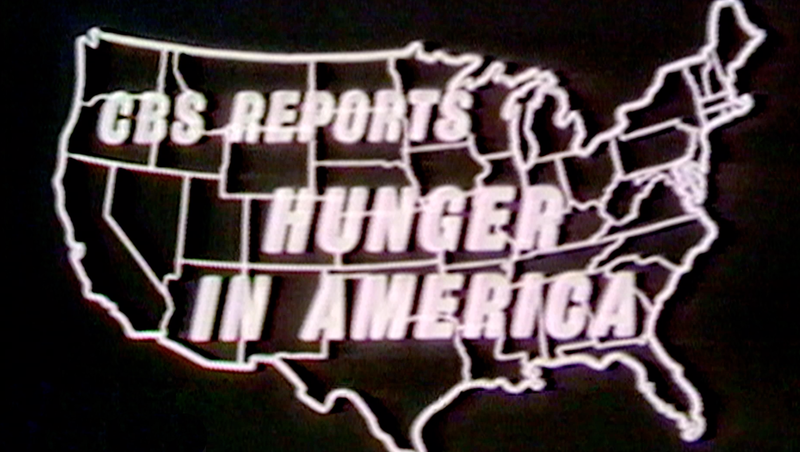 CBS’s 1968 report “Hunger in America” shone the spotlight on food insecurity in the US. This week, a story about Utah’s school lunch programs was circulated on social media. Students’ whose accounts were past due were denied school lunches, and because of food safety rules, the lunches were thrown in the trash. The outrage after reading this story was certainly warranted. Yet for 1 on 4 American children, school lunches are the only secure meal of the day. Why aren’t we outraged all the time? This might be changing. A new documentary on the topic, A Place at the Table, was released last year. This documentary traces the history of the food stamp program and hunger in America from 1968 until present, and it also delves into the political economy of USDA agriculture subsidies and the prevalence of food desserts (areas without places to buy fresh foods). I, for one, began showing this to my students last year. Many of them, after watching the documentary, told stories about their own experiences with food insecurity. It certainly moved my students. But will this documentary have a similar impact as the original CBS story in 1968? This outcome is yet to be determined, although the bipartisan support for the farm bill makes this unlikely. Although short clips are available on YouTube, the documentary doesn’t have the same captive primetime audience as the 1968 film. Likewise, the number of investigative journalists has plummeted. In 1968, the original documentary included a number follow-up news stories. A Place at the Table was featured on the Daily Show, but it has not been promoted much by mainstream news. I encourage those interested in this topic to watch and circulate the film. This latest farm bill might seem like a way to take from the have-nots and give to the haves, but it’s not so simple. Retailer Walmart just announced its sales forecasts would likely be lower due to the cuts. Less money spent on food affects retailers, truckers, processors, and, of course, farmers. Demographics of those on food stamps is also changing. According to the Center on Budget and Policy Priorities, every $1 spent on SNAP benefits leads to $1.75 in economic activity. These cuts in benefits takes $5 billion in spending out of the economy. Drawing attention to the ways in which businesses benefit from public investment could be an entry-point for bipartisan support for programs like SNAP. This entry was posted in In the News and tagged 1968, cbs, congress, democrats, farm bill, food insecurity, food policy, food stamps, hunger in america, investigative journalism, media policy, obama, republicans, snap. Bookmark the permalink. ← UDC Roundup – Brian Murphy Award and Thanks! UDC Roundup – Brian Murphy Award and Thanks!